A one-time price of GBP £20.00 will be added to your order. BTS Membership (with printed journals) is priced at £20.00 per year plus £1.10 transaction fee and shipping charges outside of UK. Digital Membership is charged at £15.00 (plus £1.10 transaction fee) worldwide. The BTS Year runs from 1st June to 31st May every year. Members joining in May will be enrolled onto the following June's membership year unless requested otherwise in customer notes. The BTS publishes 3 journals per year. All members receive a BTS Membership Pack including a personalised membership card and additional items. Members also receive access to the BTS Membership website for the duration of the year (June – May), which provides access to the digital edition (PDF) of the journal and selected back issues. Members that choose to receive our standard membership package (non-Digital) also receive our three beautiful full-colour journals within the membership period as printed media by UK First Class post or Air Mail. Please be sure to provide recipient full details (name, address and email address) in customer notes if this is a gift membership. DELIVERY: Shipping to the UK (and for Digital members) is included in the membership fee. International postage is charged at the following rates: Europe: £10:00 Rest of World: £15:00 RENEWAL: Please include your membership number in the Customer Notes section during checkout. DIGITAL MEMBERSHIP: (Select 'Digital Member Only' in the Shipping option.) 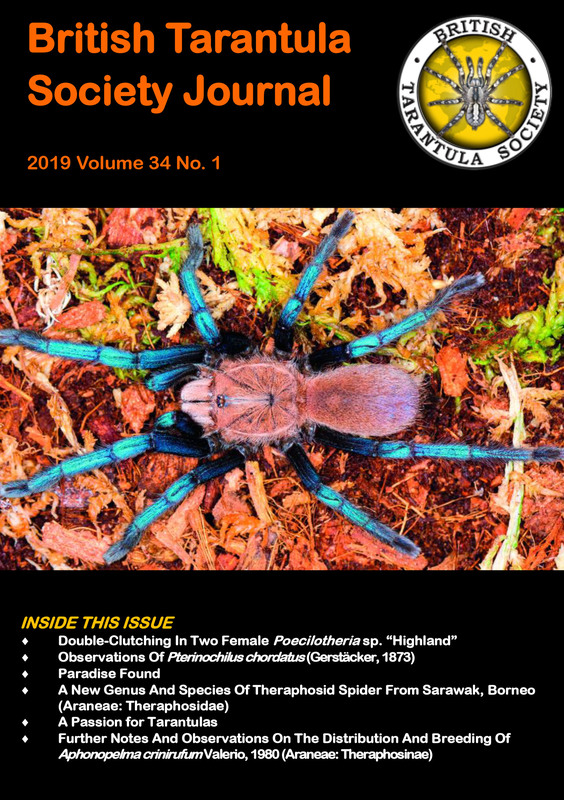 Digital membership consists of full membership of British Tarantula Society with PDF (digital) journals instead of the full colour print edition. You will also receive the full BTS Membership pack posted to your shipping address. GIFT MEMBERSHIP: Please complete the delivery address as the intended recipient for all gift memberships. If the gift is a renewal, please select 'renewal' and add 'customer notes' with details as required.